Alfredo Deambrosi joins us from South Carolina for a video Interview. 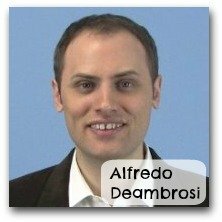 I am extremely excited to interview Alfredo Deambrosi today. He agreed to sit down in front of the camera to answer my questions so that both you and I could get to know him better and learn more about is useful website www.OnTargetEnglish.com. This is the very first video response I have received to an interview and it is wonderful. I hope you enjoy watching the interview as much as we enjoyed doing it. 1) For many of my visitors this will be the first time “meeting” you. Could you tell them a little about yourself? Who is Alfredo Deambrosi? Alfredo Deambrosi: I am an English teacher, and I really enjoy the work that I do. I often say that I love teaching almost as much as I love learning. Over 10 years ago, I started to teach English as a second language at an American university, which is where I still teach. I also teach English online at OnTargetEnglish.com. I have always lived in the United States. But my name is Italian, I grew up in a Spanish-speaking family, and I’m half German. In my free time, I enjoy reading, exercising, talking with friends. I really enjoy spending time with family. 2) What inspired you to create ontargetenglish.com? Is it your full time job? Alfredo Deambrosi: A few years ago, Holly and I realized that we could use our English-teaching experience to help English learners around the world. We had a vision for helping them improve their English skills through high-quality video. I had several years of experience teaching English, and Holly had several years of experience in video production, English teaching, and teaching speech. My primary work is with the university where I teach, and Holly’s primary work is with OnTargetEnglish.com. 3) You have created a video course for intermediate learners: English Success. Why did you decide to incorporate so many aspects of English (grammar, pronunciation, vocabulary etc) rather than focusing on one area? Alfredo Deambrosi: When you learn a language, you learn it as an entire person. You’re not just a listener, or a writer, or a vocabulary learner, or a grammar learner, or a pronouncer of words and phrases. You’re all of those. So if you are going to learn a language, you are going to do all of those activities. So our goal is help learners do all of those things. For most English learners, the goal is to understand English and use English. If those are your goals, then you will need to learn grammar, pronunciation, vocabulary, and listening. We also recognize that humans do more than just think. You also feel and desire. Any language learner knows that motivation is extremely important. That’s why we have motivational themes like “commitment” and “adventure,” which can give us the motivation and the energy to grow personally—to become better language learners and better people. 4) Who is English Success for? Can you describe the ideal student for this course? Alfredo Deambrosi: English Success is for those who already know some English and are willing to make a commitment to improve their English skills. If you can understand even half of this interview, you probably can understand enough to use English Success and to begin making big improvements in your English learning. When we created English Success, we created it for English learners on the intermediate level, but any English learner can benefit from this course. 5) Your videos are excellent. Could you tell me how you create one, from start to finish? Alfredo Deambrosi: We want our videos to be excellent in their quality because our community of English learners wants to be excellent in their English skills. When we create a unit of English Success, we first decide what the goals are for the learners. What should they be able to do at the end of the unit? Then we make an outline for the unit. We decide what each of the videos will be about and what the exercises will be for each video. We use our education, our experience, our continuing research to create the best videos in the best way that we can, because we want to help English learners in the best way that we can. Above all, English learners need videos that are clear, that are motivating, and that meet their language needs. And we believe that our videos do all of these things. 6) Many of my visitors get frustrated because they don't know an effective or interesting way to learn and improve their grammar. What advice can you give them? Alfredo Deambrosi: When I was in college, I was learning another language. And during the winter break one year, I decided that I wanted to improve my grammar in that language. All I had was a book and some worksheets. I did make some progress, but it was boring, boring, boring! Since then, I have learned to love grammar. But what I needed at that time was a motivating method to learn grammar well. So here's my advice to anyone else who considers grammar to be boring. First, have a teacher--a real person that you not only read but also hear and see. Second, get into a community of learners--a group of people who are learning the same language that you are learning. Find a friendly community of motivated learners. This community can encourage you and help you learn. Third, tell yourself every day why you are learning, why you want to become a better person. When we know why we are doing something, our motivation increases. Maybe you need to remember a commitment that you made to improve. Maybe you need to imagine what you will be able to do when you are fluent. If grammar is boring or frustrating for you, I believe that following these tips can lead to successful results. During that winter break while I was in college, I thought grammar was boring. Over the years since then, I have learned to enjoy grammar. The grammar of a language is beautiful; it really is. For me, that's the strongest motivation to learn the grammar of a language. But many language learners consider grammar to be boring. I understand; I also used to think that grammar is boring. Until you actually learn to enjoy grammar, try following the three tips that I just gave. Would you like to know the biggest mistake that student's make according to Alfredo? Click the link below to continue to part 2 of the interview. Click here to continue watching this interview with Alfredo Deambrosi.